As noted in many other On the Side articles on SmoothViews, the Washington, DC area has an abundance of in-demand, talented musicians. We are blessed. And what that means for music aficionados is that when headliners come to town and draft these guys and gals into their East Coast band for a tour, we get to experience new people and a new take on music. 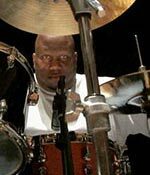 This month, SmoothViews is pleased to feature drummer extraordinaire, Jay Williams. Jay credits his Dad as his first musical influence, but his cousin was the drummer who first got him hooked. As the years passed, Jay taught himself the drums, without any formal training, and relies on his ears to do his job. He says that he can read basic music charts but doesn’t consider himself a chart reader. In addition to the drums, Jay also plays a little bass, and like many of our previously featured side musicians, names Sting and Phil Collins as artists he would like to play with one day. Be sure to be on the lookout for Jay as he’s pounding out the grooves for many of your favorite artists these days, and be sure to watch for his debut CD to be released over the next few months.